Coherix, Inc., a global leader in Three-Dimensional (3D) Machine Vision, participated in Nissan’s first-ever Manufacturing Innovation Summit at Nissan TCAT Training Center in Smyrna, TN on November 8, 2017. At the event, Dr. Zhenhua Huang, General Manager of Americas at Coherix, gave a presentation on in-line robust 3D bead inspection, sharing his expertise in innovative 3D machine vision to tackle complex bead inspection issues in automotive body structural adhesive, sealant, windshield, powertrain FIPG, etc. 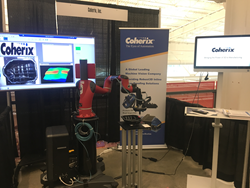 As an exhibitor, Coherix showcased and demonstrated its Predator3D™ in-line bead inspection solution for robot, 100% reliable 3D inspection. Mounted around the dispensing nozzle, Predator3D inspects the bead as it is dispensed on the parts, and reports any skips, wet-out, or neck-downs simultaneously, without bringing penalty to the cycle time. Predator3D can also automatically repair the defects, and archive 3D information for future traceability. More event photos can be found at Coherix website.